Salomon is known throughout the world for producting functional clothing and accessories for running, trekking, winter sports and climbing. They create fresh designs that are hard-wearing and high-tech. Salamon running shoes are characterised by lightweight, durable textures and sophisticated sole constructions. The stylish backpacks which can worn whilst running and are lightweight and ergonomically optimised. Racing professionals from various winter and summer sports rely on Salomon's specialised equipment. Salomon is world famous for its high-performance functional clothing and accessories that are designed for outdoor sports and leisure activities, such as winter sports, climbing, trekking and running. 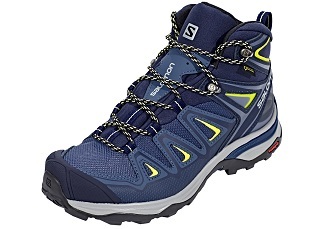 Technologies that are characteristic of Salomon shoes and clothing are their lightweight, durable and comfortable qualities. On the Addnature.co.uk website, find everything you need from the comprehensive Solomon product portfolio and get ready for your next outdoor adventure. Salomon was originally a French-owned company from Annecy in the French Alps. It was founded in 1947 by François Salomon alongside his wife and son. In 1997, it was acquired by Adidas, but more recently, in 2005, the company was sold to the Finnish company, Amer Sports. Salomon manufactures clothing, footwear and accessories for a range of sports activities including snowboarding, skiing, walking, running, adventure, racing and other outdoor activities. Its products are sold in over 40 countries across five continents. Alpine skiing and cross-country skiing have always been a key part of Solomon’s product design and many winter sports teams rely on its equipment to go to the extra level. It has also manufactured inline skates that are considered by many skaters to be some of the best-quality skates on the market. Salomon designs are renowned for their fresh, hard-wearing and high-tech innovations that use lightweight, durable materials and pioneering technologies. They are also known for their stylish designs. Sports professionals from winter to summer rely on Salomon's specialised equipment and clothing.